Apr 14 – The Sound of Soul, 11:00a.m.-12:00p.m., The English Inn, 2000 Morton Dr., Charlottesville, VA 22903, 434-971-9900. May 12 – ECK Light and Sound Service, 11:00a.m.-12:00p.m., The English Inn, 2000 Morton Dr., Charlottesville,VA 22903, 434-971-9900. Apr 4 – The Sound of Soul, 7pm-8pm, Harmonic Waves Wellness Center, 3201 Hill Street, Lynchburg, VA 24501. Apr 28 – ECK Light and Sound Service, 11am to 12:00pm. Northern Virginia ECK Center, 2810 Old Lee Highway, Suite 301, Merrifield, VA 22031. Telephone 703-916-0515. May 5 – ECK Light and Sound Service & Children’s Program, 11am to 12:00pm. Northern Virginia ECK Center, 2810 Old Lee Highway, Suite 301, Merrifield, VA 22031. Telephone 703-916-0515. May 12 – The Sound of Soul, 10am to 10:30am. Northern Virginia ECK Center, 2810 Old Lee Highway, Suite 301, Merrifield, VA 22031. Telephone 703-916-0515. May 12 – ECK Light and Sound Service, 11am to 12:00pm. Northern Virginia ECK Center, 2810 Old Lee Highway, Suite 301, Merrifield, VA 22031. Telephone 703-916-0515. May 12 – Hear the words of a modern prophet! Streaming of the keynote talk at the 2019 ECK Springtime Seminar. 1pm to 2:30pm Northern Virginia ECK Center, 2810 Old Lee Highway, Suite 301, Merrifield, VA 22031. Telephone 703-916-0515. May 19 – The Sound of Soul, 10am to 10:30am. Sacred Circle Bookstore, 919 King St, Alexandria, VA 22314. To open an event flyer for this workshop please click here. May 19 – ECK Light and Sound Service, 11am to 12:00pm. Northern Virginia ECK Center, 2810 Old Lee Highway, Suite 301, Merrifield, VA 22031. Telephone 703-916-0515. May 19 – Repeat Presentation. Hear the words of a modern prophet! Streaming of the keynote talk at the 2019 ECK Springtime Seminar. 1pm to 2:30pm Northern Virginia ECK Center, 2810 Old Lee Highway, Suite 301, Merrifield, VA 22031. Telephone 703-916-0515. May 25 – Free Workshop on: How to Have an Out of Body Experience. Beyond Astral Projection, learn how “movement of consciousness” will enable you to explore new spiritual vistas. This workshop explains how and why movement of consciousness is possible and offers take-home techniques to embrace such experiences. 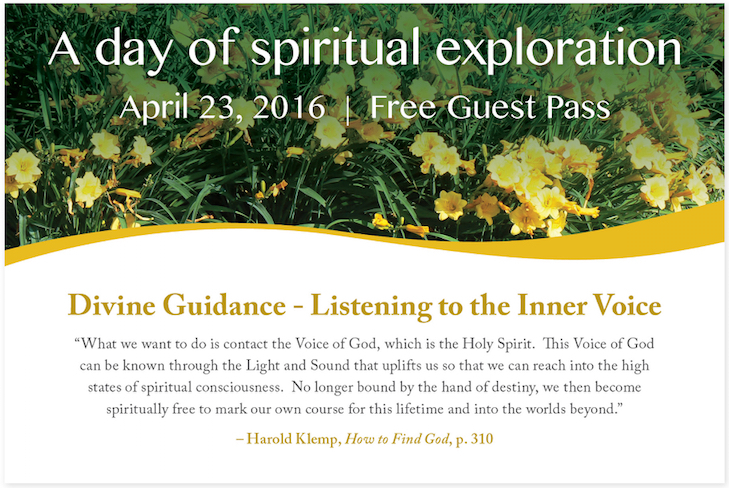 This workshop is sponsored by Eckankar, The Path of Spiritual Freedom. Saturday, May 25th, 2019, 1:00 pm to 2:30 pm at Sacred Circle Books, 919 King Street, Alexandria, VA 22314. Open to the public, free of charge. For more information call 703-916-0515. To open an event flyer for this workshop please click here. May 26 – ECK Light and Sound Service, 11am to 12:00pm. Northern Virginia ECK Center, 2810 Old Lee Highway, Suite 301, Merrifield, VA 22031. Telephone 703-916-0515. Jun 2 – ECK Light and Sound Service and & Children’s Program, 11am to 12:00pm. Northern Virginia ECK Center, 2810 Old Lee Highway, Suite 301, Merrifield, VA 22031. Telephone 703-916-0515. Jun 9 – The Sound of Soul, 10am to 10:30am. Northern Virginia ECK Center, 2810 Old Lee Highway, Suite 301, Merrifield, VA 22031. Telephone 703-916-0515. Jun 9 – ECK Light and Sound Service, 11am to 12:00pm. Northern Virginia ECK Center, 2810 Old Lee Highway, Suite 301, Merrifield, VA 22031. Telephone 703-916-0515. Jun 16 – The Sound of Soul, 10am to 10:30am. Sacred Circle Bookstore, 919 King St, Alexandria, VA 22314. To open an event flyer for this workshop please click here. Jun 16 – ECK Light and Sound Service, 11am to 12:00pm. Northern Virginia ECK Center, 2810 Old Lee Highway, Suite 301, Merrifield, VA 22031. Telephone 703-916-0515. Jun 22 – Free workshop on: Is True Peace and Happiness Possible? The treasures of every Soul are peace, contentment, and happiness. Here’s how to find them within yourself. On-the-street interviews have shown that the one thing people most often long for is peace. Techniques will be offered, that when practiced, can provide for a life of contentment and joy. This workshop is sponsored by Eckankar, The Path of Spiritual Freedom. Saturday, June 22nd, 2019, 1:00 pm to 2:30 pm at Sacred Circle Books, 919 King Street, Alexandria, VA 22314. Open to the public, free of charge. For more information call 703-916-0515. To open an event flyer for this workshop please click here. Jun 23 – ECK Light and Sound Service, 11am to 12:00pm. Northern Virginia ECK Center, 2810 Old Lee Highway, Suite 301, Merrifield, VA 22031. Telephone 703-916-0515. Jun 30 – ECK Light and Sound Service, 11am to 12:00pm. Northern Virginia ECK Center, 2810 Old Lee Highway, Suite 301, Merrifield, VA 22031. Telephone 703-916-0515. Jul 7 – ECK Light and Sound Service and & Children’s Program, 11am to 12:00pm. Northern Virginia ECK Center, 2810 Old Lee Highway, Suite 301, Merrifield, VA 22031. Telephone 703-916-0515. Jul 13 – Unfolding into Divine Love Introductory Spiritual Discussion, 11:00am to 12:30pm. Please join us for a lively talk about our sacred journey to the divine reality – the home we have never truly left, but are striving to remember. Northern Virginia ECK Center, 2810 Old Lee Highway, Suite 301, Merrifield, VA 22031. Telephone 703-916-0515. To open an event flyer please click here. Jul 14 – The Sound of Soul, 10am to 10:30am. Northern Virginia ECK Center, 2810 Old Lee Highway, Suite 301, Merrifield, VA 22031. Telephone 703-916-0515. Jul 14 – ECK Light and Sound Service, 11am to 12:00pm. Northern Virginia ECK Center, 2810 Old Lee Highway, Suite 301, Merrifield, VA 22031. Telephone 703-916-0515. Jul 21 – The Sound of Soul, 10am to 10:30am. Sacred Circle Bookstore, 919 King St, Alexandria, VA 22314. To open an event flyer for this workshop please click here. Jul 21 – ECK Light and Sound Service, 11am to 12:00pm. Northern Virginia ECK Center, 2810 Old Lee Highway, Suite 301, Merrifield, VA 22031. Telephone 703-916-0515. Jul 28 – ECK Light and Sound Service, 11am to 12:00pm. Northern Virginia ECK Center, 2810 Old Lee Highway, Suite 301, Merrifield, VA 22031. Telephone 703-916-0515. Aug 4 – ECK Light and Sound Service & Children’s Program, 11am to 12:00pm. Northern Virginia ECK Center, 2810 Old Lee Highway, Suite 301, Merrifield, VA 22031. Telephone 703-916-0515. Aug 11 – The Sound of Soul, 10am to 10:30am. Northern Virginia ECK Center, 2810 Old Lee Highway, Suite 301, Merrifield, VA 22031. Telephone 703-916-0515. Aug 11 – ECK Light and Sound Service, 11am to 12:00pm. Northern Virginia ECK Center, 2810 Old Lee Highway, Suite 301, Merrifield, VA 22031. Telephone 703-916-0515. Aug 18 – The Sound of Soul, 10am to 10:30am. Sacred Circle Bookstore, 919 King St, Alexandria, VA 22314. To open an event flyer for this workshop please click here. Aug 18 – ECK Light and Sound Service, 11am to 12:00pm. Northern Virginia ECK Center, 2810 Old Lee Highway, Suite 301, Merrifield, VA 22031. Telephone 703-916-0515. Aug 25 – ECK Light and Sound Service, 11am to 12:00pm. Northern Virginia ECK Center, 2810 Old Lee Highway, Suite 301, Merrifield, VA 22031. Telephone 703-916-0515. Sacred Sound, ancient mantra. HU is a universal love song to God. It works for all. Have you ever reached out to the universe for love and answers? Need help dealing with stress or fear? HU offers balance, wisdom, and wonder. It brings alignment with your true purpose and highest good. Life is a spiritual experience! Sing HU every day. It will attune you to the wonders of God’s unconditional love for Soul—for you. You will never be the same. Every Tuesday, 11:00am – 12 noon, For more info, see event flyer here. HU is a sacred sound and ancient mantra. It is an ancient name for God that has been sung for thousands of years in many lands for spiritual unfoldment. HU can uplift people of any religion, culture, or walk of life. You’re invited to experience chanting HU, contemplative time, and spiritual conversation with others of like heart. Apr 14 – ECK Light and Sound Service from 11:00am to 12:00pm. Discussion Topic: “God’s Gift – the Creative Imagination”. Roanoke ECK Center, 1420 3rd Street SW, Roanoke,VA 24016 (first floor back far right office of the Bea-ing Center). May 1 – Free Video Series: Wisdom of the Living ECK Master 6:30-7:30pm. “On Holy Ground” Roanoke ECK Center, 1420 3rd Street SW, Roanoke,VA 24016 (first floor back far right office of the Bea-ing Center). May 12 – ECK Light and Sound Service from 11:00am to 12:00pm. Discussion Topic: “The Language of Love” Roanoke ECK Center, 1420 3rd Street SW, Roanoke,VA 24016 (first floor back far right office of the Bea-ing Center). Click for Virginia Beach Meetup! Apr 19 – PLEASE NOTE: This event is cancelled. Norfolk The Sound of Soul, 7:00-7:30pm. Norfolk ECK Center 1500 E. Little Creek Rd, Suite 203, Norfolk, VA 23518 (757)588-5683. May 11 – Meetup: Have You Ever Wondered About Spiritual Freedom? 10:00am-6:00pm. Mt Trashmore 310 Edwin Dr, Virginia Beach VA 23462 Shelter 9. Come and talk with likeminded souls about Spiritual Freedom, Dreams, Soul Travel, and any spiritual questions you would want to explore. May 12 – Norfolk The Sound of Soul followed by ECK Light & Sound Service, 10:15am-12:00pm. Norfolk ECK Center 1500 E. Little Creek Rd. Suite 203, Norfolk, VA 23518 (757)588-5683. May 17 – Norfolk The Sound of Soul 7:00-7:30pm. Norfolk ECK Center 1500 E. Little Creek Rd, Suite 203, Norfolk, VA 23518 (757)588-5683. 6:30 pm to 7:30 pm, Bowman Library (large meeting room), 871 Tasker Road, Stephens City, VA 22655. Invite a friend! For info about Eckankar, please visit: www.eckankar.org To view an event flyer, please click here. We enjoyed seeing you at this event! Check back later for the next statewide event.